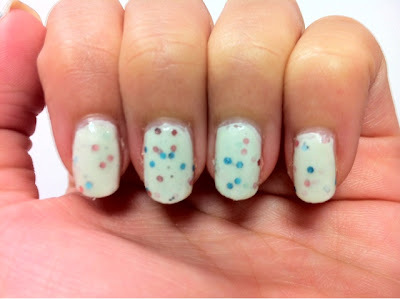 I have a polish from Stacy of Paris Sparkle’s for today’s post. I think I have posted only one other polish from Stacy on my blog even though her polishes were the very first indies I bought eons ago! *shame on me* So, without further ado lets move on to the polish! Celery Stalker is a soft minty green polish with different multi colored hex glitters – blacks, reds, blues and greens, some hidden silver shimmer and even some holographic glitter in it! I only really noticed the holo glitter when I was walking under the sun one day. It really was unexpected! Application of this polish was very very much better than Election Day! You did not have to fish for glitter and it covered nicely in 2 coats. One more photo for the road! I did a pedicure with a glitter polish I got from etsy quite some time ago – Chataigne by Paris Sparkles. Chaitaigne is French for chestnuts and this color is really quite close to it. Chaitaigne is a mixture of brown and bronze glitters in a clear base. This glitter polish is jammed pack with glitter I tell you! If you are lazy, you could easily get away with one thick coat. It is rather gritty so I used 2 layers of Seche Vite to smoothen it out. Toe pics after the jump! What better way to spice up my Paris Sparkles Election Day manicure other than Whimsical. The light blue base from Whimsical could easily be enhanced by the white base in Election Day and the hex glitters in both polishes are actually quite similar! Both in size and color. In my opinion, it looks a tad more interesting this way. 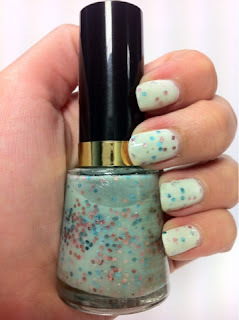 It has just a tinge of light blue and the layered glitters actually give much more depth to the mani. 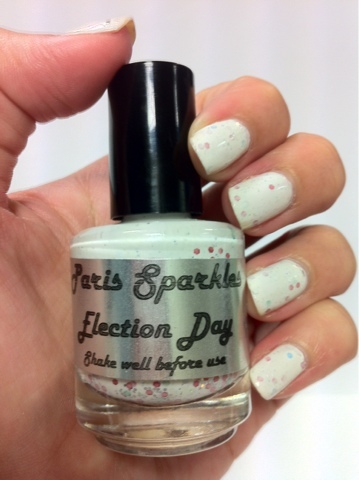 Election Day is one of the four polishes that I got from Paris Sparkles. I have always been eyeing this polish since I first discovered indie nail polishes on Etsy. I love the subtle glitter in a creamy base. Election day has blue and pink hex glitters, a dash of green hex glitters as well as fine blue and holo glitter in the mix. The formula for this polish was a little on the thick side, and the glitters all sank to the bottom of the bottle when I took it out. I don’t blame it though. It was afterall in transit for more than 2 weeks before I got it. It took about 30minutes of standing it upside down and some rolling to get the glitter off the bottom. Paris Spaekles nail polishes can be found in her Etsy shop. Also, you can follow Stacey on Facebook to get updates and flash sales in her shop!